Earlier this year, Microsoft announced that we will invest $5 billion in IoT over the next four years. This year alone we announced many exciting additions to our IoT portfolio. Among them are Azure Maps and Azure Digital Twins, platforms that will help cities navigate the complexities of developing urban mobility and smart infrastructure solutions. Announced just shy of a year ago, Azure Maps is Azure’s location intelligence portfolio of mapping, navigation, traffic, and geospatial services. Azure Digital twins, recently announced at Ignite, is a service for companies to unlock spatial intelligence through the modeling of the relationships between people, devices, and the environments they exist in. Together, these services empower organizations to unlock deeper insights from spatial intelligence, geographic enrichment, and location-based services. Today, we’re excited to announce strategic partnerships across both platforms and solutions built by Azure IoT partners to further help cities meet their ambitions of becoming Smarter Cities. Last year, when we announced public preview of Azure Maps (formerly Azure Location Based Services), Sam George, Director of Azure IoT, took the stage at Automobility in Los Angeles and highlighted the criticality maps have on Smart Cities stating, Azure Maps “includes geographical data that can better connect smart cities, infrastructure and IoT solutions, and empower industrial transformation, from manufacturing to retail to automotive – and everything in between.” Now, we’re echoing that message more prominently through a new partnership with Moovit, Inc.
Moovit will be the supplier of Public Transportation Routing services (aka Transit Routing) through Azure Maps natively from within Microsoft Azure. Once integrated, Azure customers will have the ability to use transit routing for a slew of applications including smart cities, transportation, automotive, field services, retail, and more. In the context of IoT, customers can extract insights such has public transit ridership, cost benefit of transit/ridesharing/driving/bikes, justification for additional public transit, or additional taxation for roads and parking. Since these services will be native to Azure Maps, customers will also be able to use the Moovit-powered services as an additional mode of transportation to complement current routing capabilities such as driving (including traffic influenced, HOV, toll-road avoidance, etc. ), walking, taxi, and motorcycle. In the context of automotive, and with so many people moving further outside of urban centers, many commuters are moving farther away from the city centers, but still wanting to use public transportation. As such, public transit information is getting further integrated into vehicles in order to provide multiple modes of transportation – commute to a rideshare or transit center, and ride the train or bus into the city. This helps minimize urban congestion and reduces cost for additional fuel and parking. Not to mention it reduces carbon footprint and noise pollution since the individual vehicles are parked far outside the city. According to the International Association of Public Transport, worldwide, in 2017, the 178 metro systems accounted for a total annual ridership of 53 billion passengers. In the last six years, annual metro ridership grew globally by 8.7 billion passengers (+19.5%). This partnership with Moovit will help in servicing Azure customers’ needs to service both their own internal applications and insights, as well as, their customers who require public transportation. Today is a hallmark day and we’re proud to have Moovit as one of our partners – a highly innovative, reputable company in the location space, bringing clout through rich location data and services to Azure and its respective customers. 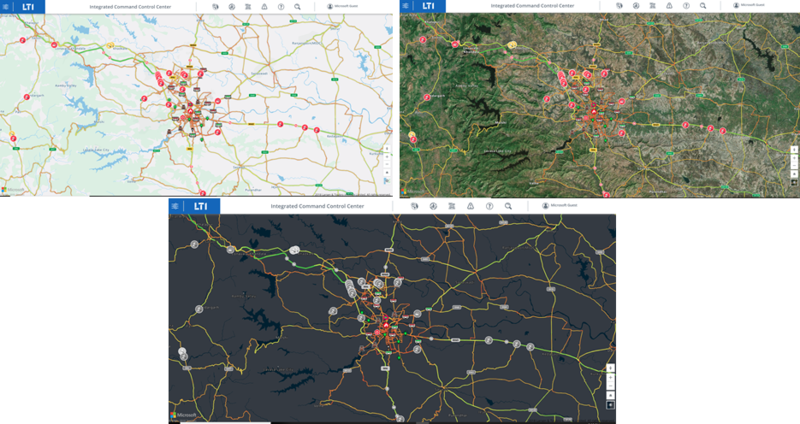 Though both Azure Maps and Azure Digital Twins are among the newest additions to the IoT portfolio, already we have seen partners leveraging these platforms to tackle some of the challenges of creating safer, smarter cities, from LTI leveraging Azure Maps to manage city-wide events in a centralized advanced operations center, to LTTS, who is using Azure Digital Twins to better manage facilities across entire connected campuses. City infrastructure is costly to manage, and cities must address the challenge of efficiently operating numerous buildings, from city halls, to libraries, to community centers. One partner is rethinking ways to make buildings more efficient and people centric. View manufactures View Dynamic Glass, a new generation of dynamic glass windows that let in natural light and views, and enhance mental and physical wellbeing by significantly reducing headaches, eyestrain, and drowsiness. In addition, View’s windows reduce glare and heat, improving the energy efficiency of buildings by up to 20 percent. By using Azure Digital Twins and other components of the Azure IoT platform, View can leverage its domain expertise to create smart buildings that that drive occupant satisfaction and are more energy efficient. An exciting partner that is building smart city solutions that integrate Azure Maps and Azure Digital Twins is LTI. A challenge for local and city management and administration teams is understanding what is happening in the city and responding with the right resources, in the right order, to responsibly manage city operations, from traffic and public transit to crime and safety incidents, and environmental alerts. LTI is addressing this with a comprehensive, advanced, and intelligent operations center solution for tracking and managing city operations and response management. The Advanced Operations Center gives city administrators an easy to use interface to deal with and manage all types of real-time events across a city. 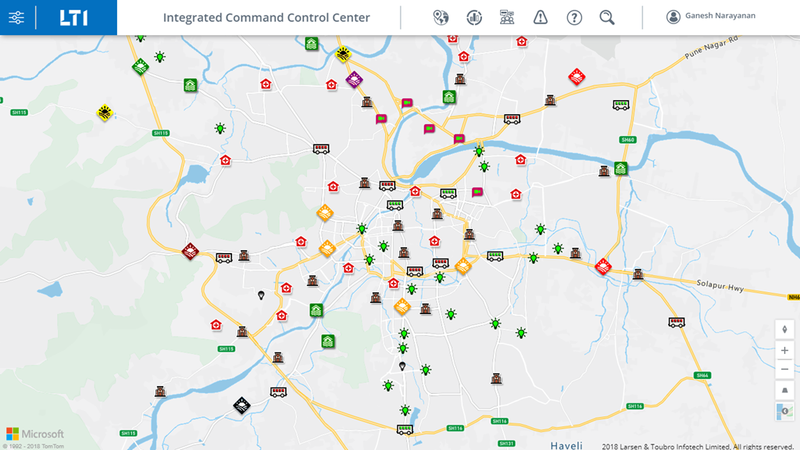 The Advanced Operations Center streams real-time telemetry from various sensors across urban settings leveraging several Azure services, including Azure Maps. Within one interface, city administrators can obtain real-time situational awareness of various events, leverage GIS tools to conduct in-depth analysis, optimize response management, track historical trends, and collaborate with other city operators. Through the dashboards, city operators can seamlessly customize the base map (image 1) choosing among satellite imagery, gray-scale maps, or the standard Azure Maps base map. Image 1: City Operators can configure the base map, choosing from a range of different imagery styles. They can also leverage the Azure Maps traffic service for rendering real-time traffic flow and incident data – dynamically rendering growing levels of detail based on zoom level (images 2 & 3). The advanced operations center enables operators to execute standard operating procedures for the various events and respond to the various situations effectively. Event notifications in the Advanced Operations Center enable quick tracking of the events and collaboration (image 4). Image 2 and 3: On a single pane, operators can visualize and manage multiple categories of city events. Image 4: City operators can track the most recent measurements and alerts relating to different city events. Image 5: Operators can hover over sensors on the map, such as a streetlight, shown above, and quickly recover status updates related to the device.